Hey bloggers out there. I know, I know. I typically write fiction. But recently, I went through a foreclosure and I started working on a non-fiction piece. Perhaps no one cares, but perhaps some of you went through something similar. I was originally planning on finishing it, and then most likely self-publishing it (because I’m no expert on how to cope effectively), but I’ve decided to share it with you all out here on the blogosphere instead. Enjoy. The idea for this collection of short stories and essays came from a divine daydream. I hardly believe in ‘ideas’ themselves. And I think writers (or at least me) have multiple personalities, or perhaps just while we’re in different characters’ heads. I chose the title White Desk Stuff because my parents’ home recently foreclosed. A few days before Christmas, to make it worse. We packed everything up and cleaned the entire house from top to bottom in a week and a half. The entire experience was…stressful isn’t even the word. I had hardly started my Christmas shopping and was in the midst of a total devastating tornado of emotions and guilt from all parties involved, including my dog, and the way it happened was so fast that we didn’t really have time to process it, let alone cry. We moved into the new house, which was half the size of the one we had just lost, and there was so much furniture, boxes, and garbage bags everywhere that it felt like we didn’t really have a home. I started unpacking, carrying boxes and things up to my new room. 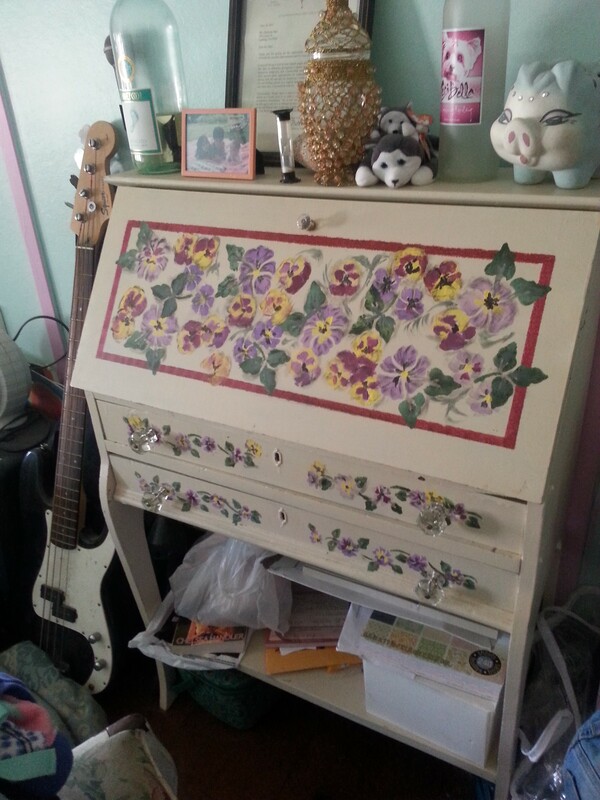 I have a vintage, white drop-top desk with flowers hand-painted on it. It’s usually where I sit and write. So, most importantly, I wanted to find the box marked ‘White Desk Stuff’ first and foremost. I went crazy trying to find it, climbing on top of heaps of boxes and bags and furniture, but I found it. I was laying in my bed one night, after it collapsed due to the lack of a box spring and not enough wood slats, and I just kept staring at the box. White Desk Stuff. All of the instances and thoughts and memories hit me all at once and I just kept thinking of the severity of the blow we had just been dealt. My childhood home, the one my parents owned for twenty two years, was taken from us. Just like that. No second chance, no opportunity to keep it. It was gone. I started crying, for the first time, about the house and everything we had just been through. The whirlwind of emotions and thoughts that flooded through my mind and body was so overwhelming that I suddenly got an “idea”. White Desk Stuff. The ‘stuff’ you keep in your desk. The emotions. The experiences. The crumpled papers that mean nothing to you now but might mean something to your grandchildren decades from now. The things you throw away and the things that you keep. The memories. The break ups. The laughter. The tears. The people. The past. The present. The future. Desk stuff doesn’t hold only material items, but memories and hopes as well. I realized in that split moment just how devastating this experience was. How stressful it all had been. And how many people experienced it in this day and age. Just at my job alone, two of the women I work with and one man have lost their homes. At my mom’s job, four people have as well. So many people I have spoken to and encountered in the last year alone have been affected by the foreclosure process. Hell, even the realtor who came to give us our relocation check had lost his home. How many people must go through this? How many families must suffer? If you want to read the rest of this book as I write it, just follow my blog and sign up for e-mail notifications of a new post. I’m putting this up here for free in hopes that it will reach even just one person and let you know you’re not alone.